The claim had been issued for a breach of conditions as a motor scooter had been parked in an area on the Spinningfields Estate, Manchester in April 2016. The defendant had two defence points which were no Locus Standi and inadequate signage. Locus Standi was very briefly discussed but the Judge appeared to accept that ES had it. Signage was then discussed. The defendant stated that they had parked their scooter in an area that they believed was part of the public highway (a paved area). Mr Hargreaves advised the Judge that there was clear signage 10ft away from where the scooter was parked which stated 'no stopping'. The defendant advised that the nearest signage is at least 20ft away and was partially obscured by trees. The Judge looked at a set of photos of the area provided and told Mr Hargreaves that the photos showed that the signage was certainly more than 10ft away. The defendant advised that there had been no parking ticket placed on the scooter. The Judge then read from POFA schedule 8 and 9 regarding the issue of notices (I was unclear as to why he read both as I believe that paper tickets are not issued at this site) The Judge then asked to see a copy of the notice that had been issued. Surprisingly, Mr Hargreaves did not have a copy of this. The Judge commented that a copy should have been made! The Judge asked Mr Hargreaves to show him the terms and conditions on the signage. On viewing copies of the signage, that Judge stated that the signage was forbidding, there was no mention of the word 'contract' on them. The word 'breach' was on the signage. As a result of this, the only person that could bring a claim was the landowner for trespass. Mr Hargreaves said that the signage had been approved. The Judge asked who approved it. Mr Hargreaves said the IPC approved it. The Judge asked to see a copy of the IPC code of practice but Mr Hargreaves could not oblige. The Judge then delivered his verdict which was in favor of the defendant. Loss of earnings/expenses were then discussed. The defendant stated that she was a self employed solicitor. She had two cases at a court that she had to pay another person to attend instead. The Judge asked what the cases were and the defendant gave details. The Judge then awarded the defendant £125. I found Mr Hargreaves to be a pleasant man who did not say very much in the hearing. I got the impression that he has had very little (if any) experience in parking issues. 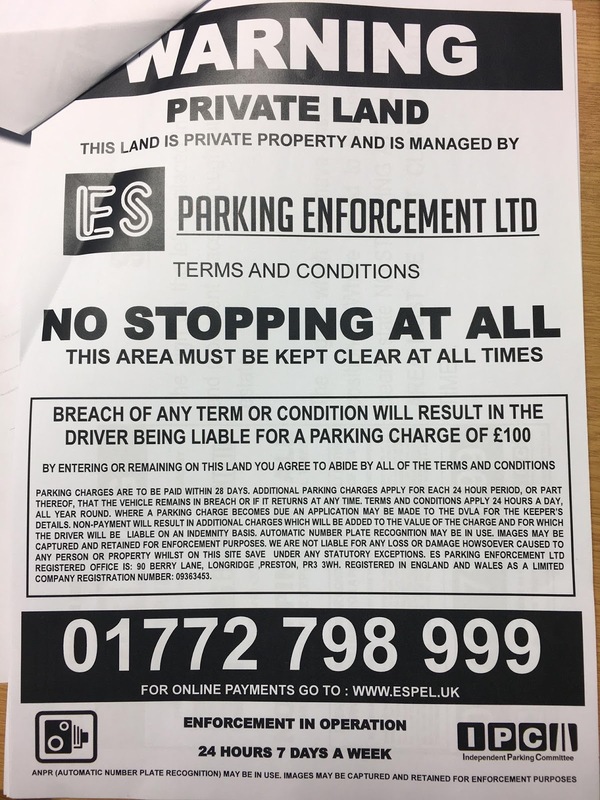 The only losers yesterday were ES Parking as they will have to pay Gladstones Solicitors for sending Mr Hargreaves and pay the defendant £125. No wonder Gladstones are keen to issue claims on behalf of parking companies because they are winners everytime even when the parking company loses. As we left the court room and went down in the lift, Mr Hargreaves commented to me 'you look different without your hat'. 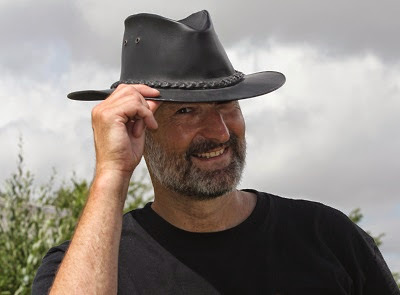 I suspect he thought I was the Parking Prankster as the Prankster wears a hat in the photo of him on his website! Congratulations to Ms A. on your well deserved win. Not all people turning up in court without hats are The Prankster. When a parking company joins the IPC the signage is vetted by Will Hurley and John Davies (or their employees/agents). 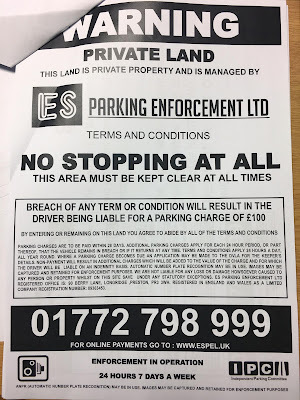 They have been warned almost since they started that their signage model does not create a contract and therefore are well aware that they risk their member's livelihood by advising them to create parking schemes which are not enforceable. Will Hurley and John Davies then encourage their members to use their other company, Gladstones Solicitors to take court action to try and enforce charges. There is a clear conflict of interest when two scoundrels who clearly do not have the same understanding of contract law as judges are encouraging parking companies to use their signage model in one company, and then take futile legal action with another company. In one case this year a Gladstones Solicitor client was ordered to pay £2,000 in costs for their unreasonable action in bringing a claim in the first place. Mr N had previously won another case on 16 Sept, where the Judge ruled that his tenancy agreement gave him an unfettered right to use the allocated parking space, and that the terms could not be varied by PPC signage. He was requested to obtain a transcript of that Judgment. Today’s hearing was a ‘test case’ for the seven other claims at various stages in the court process, which the previous Judge’s order had said must be stayed pending the outcome of this. This was back in front of District Judge Coonan, who had dismissed PACE’s claim on 16 Sept. The adjournment order from 30 Sept allowed both parties to file additional witness statements, and Mr N supported his with the judgment transcript from the Jopson case. PACE had filed copies of letters sent to tenants by Affinity Sutton (the landlord) starting in 2006 when the first permit parking scheme had been introduced. But there was no copy of a letter allegedly sent to Mr N, notifying the appointment of PACE in 2014, and Mr N’s statement said he never received this. PACE were represented by their Director, Michael Charman, who to his credit had declined the offer of an LPC rep, and actually made a far better job of arguing his own case. Mr N was represented by Bargepole, who was also given moral support and useful suggestions, from both Andy Foster and John Wilkie, who turned up to sit in the cheap seats. 3/ Given that it was stated on these letters that the purpose of the scheme was to “allow residents and visitors to park within the estate by deterring unauthorised parking”, whether there existed any legitimate interest in issuing charges to bona fide residents, such that the Beavis judgment could be distinguished and the charges deemed to be penalties. Point 1 was quickly disposed of, as we had two persuasive judgments, one from the current Judge, and also one from the Jopson case. The whole matter turned on point 2; whether the letters from Affinity represented a variation on the terms of the tenancy. Mr Charman relied on clause 6.3 in the tenancy agreement, which stated that the landlord could change the terms of the tenancy by notifying the change, and by consultation with the residents. As Mr N had obtained permits from both previous PPCs, he argued, this signified Mr N’s acceptance of the change, and his company being appointed in 2014 was simply a change of contractor. The defence argument was that these letters did not explicitly state that they were a variation on the terms, and that in fact the wording at the foot of the letters stating “This letter does not imply that any tenancy exists or will exist”, negated that argument. Furthermore, since there was no letter in evidence relating to the present contractor, the new terms, if any, could not be determined. The Judge agreed with this argument, but via a different route. She spotted, which neither Bargepole nor Mr Charman had, that the clause 6.3 specified that one month’s notice had to be given for any variation. The original 2006 letter, appointing P4 Parking, only gave 10 days’ notice, and was therefore not compliant. All subsequent changes of contractor were based on the assumption that there had been a variation, and there was nothing in evidence to show that Affinity had lawfully varied the contract. Therefore, Mr N could rely on his original 2000 tenancy agreement, granting him the right to park with no requirement to display a permit. The Judge dismissed the claim, and also made an order striking out all other outstanding claims against Mr N. Mr Charman also agreed not to pursue any other unpaid tickets (about £2,000 worth in total). Mr N, being self employed, was not able to show evidence of loss of earnings, so no order for costs was made. Once again Gladstones tactics of filing multiple claims has backfired, as PACE will have incurred multiple filing costs and solicitor fees costing Mr Charman around£600 more than was actually needed. This was a case where a vehicle was parked several times without a permit in a little used car park at the University Of Surrey. 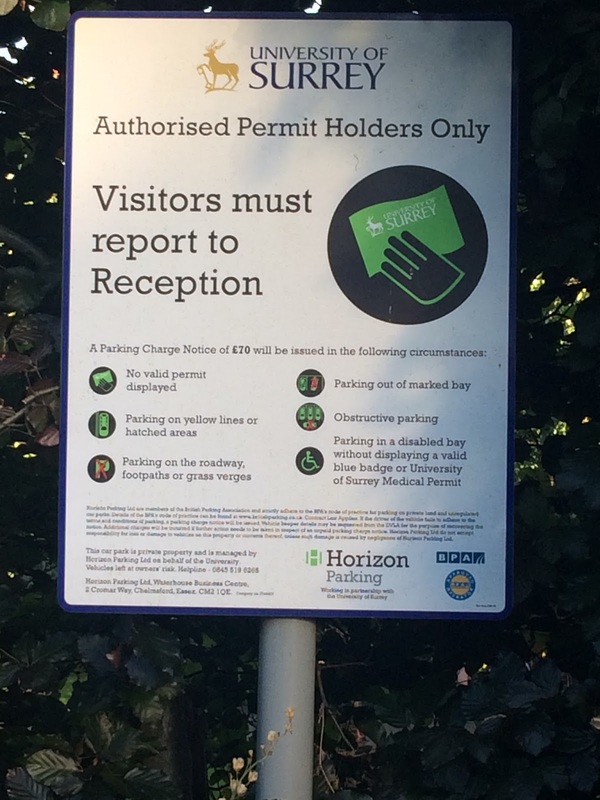 This signs clearly forbade parking without a permit, but for some reason Horizon Parking were badly advised by Gladstones Solicitors that the signs offered a contract to park, and so they claimed against Mr J. for a contractual charge. I have to say the Judge seemed very fair and picked apart anything said by both parties consistently. Claimant alleges that Defendant parked his vehicle on 3 occasions. Particulars of Claim are brief, as they often are with online claims, but included dates, amounts, etc. Defendant submitted his initial defence, documents and witness statement. This mainly focused around putting the claimant to proof that he was the driver and then covered many other legal points. Unfortunately, the defendant’s WS was not received by the Claimant and the deadline for this was incorrectly set for only 7 days before the hearing. The Claimant was given 10 minutes to read through a copy of the WS, then all parties were all happy to proceed. Both witnesses were available for evidence – Defendant and Director of claimant Horizon Parking. Claimant put to the Court to consider whether Defendant was the driver, rather than consider PoFA / whether they could pursue as registered keeper. Judge advised she cannot presume Defendant is the driver, but has to use all of the evidence to find a fact based on balance of probability. Claimant has stated they carried out all steps to warn driver and allow someone to appeal. Judge satisfied Claimant served PCNs on car (evidenced by photos), satisfied letters sent to RK (evidenced by copies). Defendant accepts received letter before action from Gladstones, unsure if received some or all of others from Horizon, but advised he would not respond anyway to an unknown company he has no relationship with. Claimant is entitled to write to DVLA RK address, cannot be criticised for that. Judge says it is likely that Defendant was aware of who Horizon are and why they were writing, and therefore could have written back. Judge agreed Defendant had chosen not to and found his answers less than clear. Judge considered all circumstances including the fact this is my vehicle, that Defendant had not stated he was not the driver in my defences and given unclear answers today, the fact that he had the opportunity to respond and chose not to; these factors influenced her decision. Judge said he should have at least denied he was the driver by responding to the PPC and in his witness statement. Because of this, and putting the onus on Claimant, plus having no evidence that he was elsewhere, the Judge found that Defendant is the driver as a fact. Therefore the Court must consider his other points which are relevant to enforcing a contract on a driver, but they can ignore PoFA on this occasion. Found photos and signs are clear from both Defendant’s and Claimant’s photos. This binds a relationship between them. The Consumer Rights Act cannot help defendant here as the signs are adequate. Judge finds this is a forbidding notice, not an invitation to park on certain terms. It disallows other parking. Could be construed as only applying to permit holders, not others who are forbidden from entering the area. IF this is the case, it only offers to permit holders. This therefore means this is a landowner issue for trespass. The agreement between PPC and landowner does not allow for Horizon to collect for trespass issues. This notice forbids any parking at all except by permit holders and is not an offer at all. Does not make a contractual offer, so they cannot claim against me for this. Judge cannot find a £70 charge excessive considering findings of other hearings. However Judge says that additional £50 costs added on could not be claimed. The signage simply says additional costs could be claimed and does not say what these are - this is not contractual and therefore additional costs must be proved. Part 16 CPR – ample evidence given. Primary point – finds me the driver as a fact. Claim dismissed because notice is a prohibition and claimants are not entitled to pursue for trespass, they are not the landowner. Regarding defendant costs, whilst he may ask for costs, it would have assisted if he had responded to correspondence with the Claimant on many earlier occasions and possibly avoided a claim, therefore she will not be awarding costs to him. Claimant requested permission to appeal, REFUSED because this is a finding of fact and the Judge feels she is correct that this cannot be a contract. Satisfied with her finding of this. As usual only Gladstones Solicitors come out as winners in this case. Perhaps the biggest losers are the university, who have contracted someone to manage their car parks and now find they are not competent in the least to do this, and have created a policy they cannot enforce. The Prankster notes that the University could still claim against Mr J for trespass, if they so desired, but presumably they did not expect to need to get that involved. Taking a look at the actual situation, the University have a surplus of car parking spaces, which a forward looking parking management company could actually monitise for them. One example would be Your Parking Space. Instead, they have contracted a greedy parking company who are not providing proper management and appear to be mainly concerned with lining their own pockets. 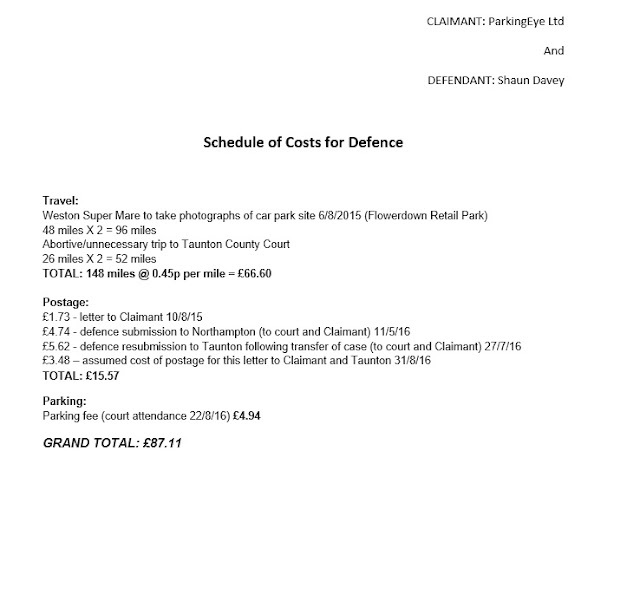 That parking company were advised by an equally greedy solicitor firm, Gladstones Solicitors that they had a case. The Prankster considers it basic contract law that the sign does not offer a contract, and that any competent solicitor should have realised this was a trespass case and warned their client Horizon that they had no standing to bring the case. Horizon Parking - you've been Gladstoned! Other drivers who have paid Horizon Parking at this car park may have a claim against then, and this goes back for six years. The driver could potentially claim not only for the parking charge paid but also £750 for a data protection breach for using personal details to pursue a charge which did not and could not have existed. A similar situation may exists for other car parks where the signage is forbidding. Mr F purchased a valid ticket, but Excel claimed he did not. There have been a sizeable number of cases where Excel's machines failed; this was yet another. On the Monday evening three days before the claim Excel tried to ambush Mr F by sending new evidence in the form of a list of all the registrations which had paid for valid tickets. The list was exceedingly useful because, due to data protection regulations, every single registration was redacted. Mr F had prepared carefully, but this was not needed. On the day the judge only gave him the chance to describe his version of events and the 'rep' from excel (with no solicitor present) to state her case. The evidence they tried to hijack him with on Monday evening ultimately was their downfall and backfired on them with the judge using this to state that the chances are that Mr F's registration was among the redacted registrations and that he therefore paid for a ticket. This was yet another case concerning the unreliable ticket machines used by Vehicle Control Systems. Mr A had let his daughters borrow his car and they went to park at Albert Street. VCS claimed they had not purchased a ticket. The daughters thought otherwise. Mr A informed VCS he was not the driver and asked for photographic evidence so he could determine which daughter was the driver. VCS did not provide any. They filed a claim against Mr A through BW Legal. In court BW Legal's representative clearly explained the provisions of the Protection of Freedoms Act and the requirements of paragraph 9(2) needed to establish keeper liability. As these were not met, keeper liability did not apply. The case then turned to whether Mr A was the driver. As he was not, the claim was dismissed. The court did not need to consider the matter of the reliability of the ticket machines. BW Legal has a strategy of taking keepers to court when they know keeper liability does not apply and when they have been informed the keeper was not the driver. This does not seem to be working out very well for them. They quote the case of Elliott v Loake which they claim is case law which states that the keeper is presumed to be the driver. Regardless of the merits of that case, a moments thought would convince any competent legal practitioner that cannot be true. The Prankster has many times driven vehicles where he was not the keeper, and has many times allowed other drivers to use vehicles where he was the keeper. Most other motorists/keepers will have had similar experiences. As it happens, Elliott v Loake has no merit whatsoever in this application, as in that case there was compelling evidence that the owner was the driver, and the appeal judge stated so in his judgment. The only applicable case law is that if there is ample evidence that the owner was the driver, then the owner is likely to have been the driver. Legal practitioners like William Hurley and John Davies who do not understand this basic principle should not be practicing law, and should not be allowed to run a parking trade association. As it happens the use of Elliott v Loake in this way has been debunked in subsequent criminal cases, where it is established that the burden of proof is on the claimant to prove the defendant was the driver, and it is not enough to merely state that the defendant was the registered keeper. The Prankster understands this is because they have no advertising consent. It is a criminal offence to display signs without the correct advertising consent. Wyre Planning Enforcement Officer Charlotte Parkinson has informed Asda of the requirement to get the necessary consent, and ASDA has covered the signs until the process is complete. 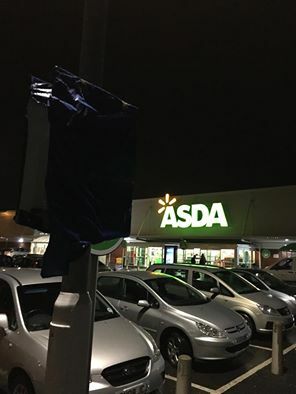 ASDA use ParkingEye to mismanage their car parks. The Prankster has been in touch with a ParkingEye employee who unofficially told him that ParkingEye's policy is to save money by not bothering to apply for advertising consent for their signage. They only apply if they get rumbled and the council investigates. Although this employee does not officially speak for ParkingEye, the evidence up and down the country would suggest this is true. 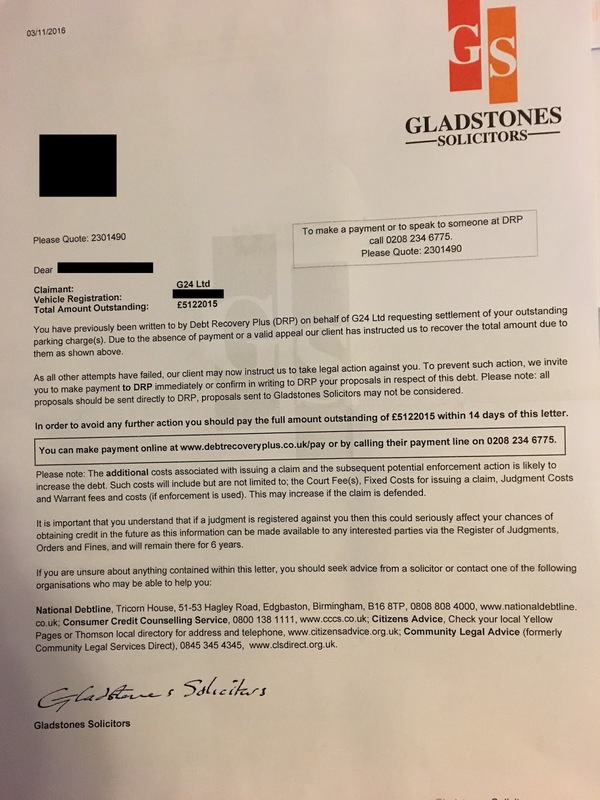 Woefully incompetent legal firm Gladstones Solicitors have been sending out letters claiming millions of points for disputed parking charges. In the latest letter they are claiming £5 million. By a process of psychic communion with the universe The Prankster estimates the most they will charge this year is in the region of £31 million, and in fact may well be exactly £31,122,015. Gladstones are famous for being an incompetent bunch of shysters who don't even know how to file a claim properly. Normally, this would be a disadvantage for a firm of solicitors, but they seem to have found a willing audience in parking companies. Now it seems they are moving their incompetence into the field of debt collection. The letter does not give any contact details to write to either Debt Recovery Plus or Gladstones, so the Prankster suggests that the email addresses of info@drpl.co.uk and enquiries@gladstonessolicitors.co.uk are used. UKPC had a representative there, who was there for another case. He said before we went in that he wasn't there to represent the case but to make sure it was discontinued, so I told him I was applying for costs and gave him the schedule. He ran around a bit looking anxious, and got his big book of CPRs out which he was thumbing through furiously while I sat there as calm as you like, which was nice to see. Went in and had to do very little. The judge had obviously been through everything thoroughly and made it quite clear he thought it was a good job they discontinued because they had no legitimate claim. He asked if I'd incurred costs so I gave him the schedule. He said it all seemed fine to him, and asked their guy if there was any reason not to award them to which he responded that there was no automatic order of costs after discontinuance on small claims. The judge shot him down straight away with that wasn't the point, the point was whether they had been reasonable or not. Their guy tried to say the discontinuance was because they received the lease, and had I submitted that earlier they wouldn't have continued, to which the judge said I submitted it exactly when I was required to and there was no reason why I should have done so earlier, and they should have made an effort to check whether they had a genuine claim before proceeding. The judge awarded my full costs of around £350, told their guy to go back and "tell [his] masters such behaviour won't be accepted in future". He then asked him if he was representing any other cases today, to which their guy responded "not in front of you" and the judge replied "good". Many parking companies jump into residential parking enforcement without doing the proper due diligence before signing contracts with the management agent. The legal situation is that if your lease gives you rights to park then you have primacy of contract and other parties cannot unilaterally introduce terms and conditions. If a parking company requests your data from the DVLA in such situation then it is likely there is a data protection breach, as they had no right to request your data from the DVLA in the first place. It is up to the parking company to do the proper due diligence. You may be able to make a claim against the parking company in such a situation. You should also complain to the DVLA that the parking company are issuing tickets on land where they have no rights to do so. If the DVLA have not put proper steps in place to audit parking companies and keep your personal data safe then you might also have a claim against the DVLA. The right to claim lasts for 6 years, so if you have received or paid out a parking charge in such a situation you can claim for your money back. If the parking company requested your data from the DVLA you might also be able claim for a data protection breach. AS Parking have discontinued a number of claims. It is not known if this is because they realised they had been deceived by Gladstones Solicitors into making the claims, or whether both they and Gladstones always realised there was no prospect of success in the first place. Having had their bluff called by the motorist they have chickened out to save the hearing costs and costs of hiring an advocate to represent them. If you have had a claim discontinued by AS Parking please contact The Prankster or comment in the notes below. 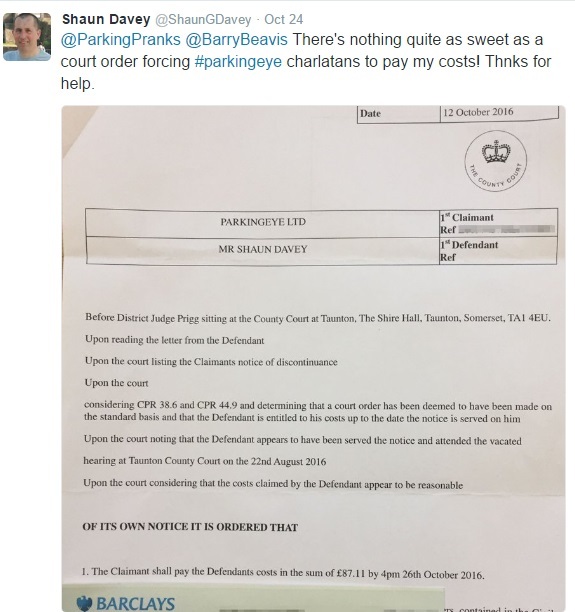 Parking companies have been abusing the court process in droves and getting default judgments against people who did not even know there was a claim against them. Financially responsible people have problems moving home and even getting jobs. As huge numbers of parking charges are not valid (around 85% of appealed charges are cancelled according to statistics provided by ParkingEye and POPLA) this means that people who have done nothing wrong have their lives ruined by irresponsible parking companies. The Law Gazette has reported that the MoJ are now investigating the problem. The Prankster suggests that motorists contact their MPs to put forward their suggestions for modifying the claim process. In 2014 Mr Bush briefly visited an Excel car park (Providence Street Wakefield) to drop off his friend. He stayed only long enough to do this, and then drove to another car park (Trinity Walk) where he parked up, ran some errands and ate some food. He then returned to pick up his friend, reversing in the car park entrance (but not actually entering the car park), and left. He was therefore a little surprised ten days later to receive a parking charge for staying two hours in Excel's car park, from 18:12 to 20:15. He appealed to Excel, but they turned this down and then harassed him for two years before eventually filing a claim. 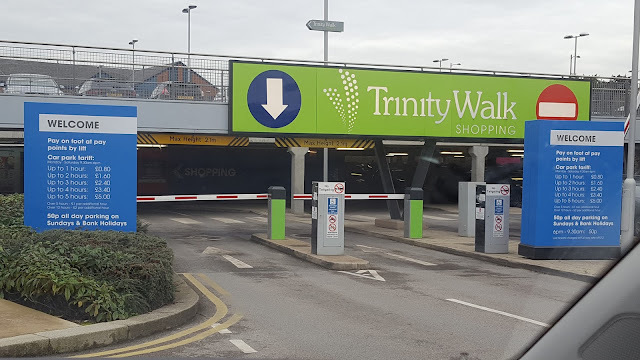 The important point to note is that Trinity Walk is a barrier controlled car park. The only way you can get a ticket is by driving a vehicle up to the barrier. The only way you can get your vehicle out is by putting the ticket in a pay machine. This is therefore pretty conclusive proof that Mr Bush was parked in Trinity Walk, and was not parked in Providence Street. Mr Bush made many efforts to get Excel to drop the case, but all these fell on deaf ears. 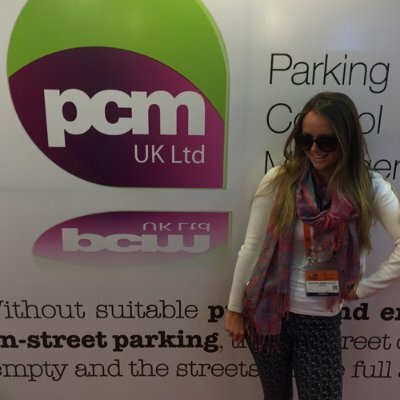 Excel Parking handed the claim management to BW Legal, who used Elms Legal to provide an advocate for the claim. They in turn used a free agent, Miss Devans-Tamakloe, a barrister in search of chambers. Miss DT was handed a bit of a hospital pass by BW Legal, as they did not give her Mr Bush's witness statements and only gave 1 piece of the 19 pieces of his evidence. Nevertheless, she managed a creditable performance. Mr Bush had a lay representative from the British Motorists Protection Association, Mr PP. The hearing was in front of DJ Dodd, a former associate of LPC Law. Ms Dodd explained the procedures for the benefit of the lay representative, arranged for photocopies of the witness statement to be provided for Miss DT and agreed with both parties there were no legal issues to consider. The claim was purely on the facts. Miss DT then took the floor, working through the witness statement of Sohail Ismail, a litigation executive employed by BW Legal. Most of M. Ismail's statement was not relevant, being a BW Legal template witness statement. There was a section attaching Mr Bush's defence but sadly most of that had been copied and pasted from another claim, and therefore was entirely irrelevant. The only statement addressing the actual defence accused Mr Bush of lying using fact his brake lights were on. All parties scrutinised the picture of the car exit for some time, looking for the brake lights, but were unsuccessful. Miss DT hazarded a guess that there was a white spot which might have been a brake light. DJ Dodd was not convinced. Miss DT then explained that what the witness actually meant to say was not that the brake light was on, but that the reversing light was off. Mr PP objected that as the witness was not there they should go with what they had said, not what they might have meant to say. Miss DT rested her case. Mr PP asked if could point out several other anomalies in the witness statement but DJ Dodd refused. As there was no witness present, there was nobody to cross-examine. Mr PP then took Mr Bush through his witness statement. DJ Dodd was critical about the presentation of the evidence as it was not numbered and therefore very hard to find. 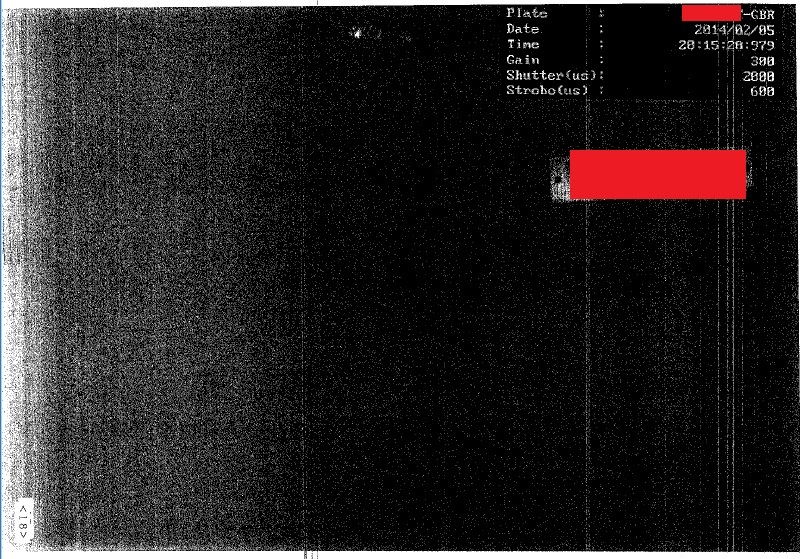 Additionally, some had suffered in the printing process and was not readable, as the court had printed the emailed evidence pack in black and white. A key moment occurred when Mr PP whipped out the picture of the car park Mr Bush had actually parked in. DJ Dodd asked what the relevance was. Mr Bush, under questioning, explained the picture showed this was a barrier car park and you could not get in unless you took a ticket to raise the barrier, and could not get out unless you put the same ticket in the payment machine, and paid the due amount. The due amount matched the amount confirmed by the bank. Mr Bush's evidence contained a lot of information regarding ANPR inaccuracy and DJ Dodd ruled Mr Bush could not be questioned on this as he was not an expert witness. Mr PP then summed up by stating Mr Bush had produced a credible and consistent version of events backed up by evidence and that Excel had produced nothing to address the accuracy of their ANPR and it was up to the claimant to prove their claim. DJ Dodd stated that was up to her to decide. She then made her judgment. She stated the claimant's witness statement apparently showed the car exiting and leaving. However, it was signed not by an employee of the parking company but by an employee of their solicitor and so she would give it due weight on that basis. Moreover, Mr Bush had made ANPR accuracy his only defence from day, and the witness statement did not address this in the slightest. Mr Bush on the other hand, was a credible and honest witness, and claimant had done nothing to address the purchase of a ticket in another car park. Mr Bush had also put a huge amount of work into his bundle. She therefore preferred Mr Bush's version of accounts and the claim was dismissed. Mr Bush asked for his lay representatives travel costs based on unreasonableness. DJ Dodd refused to accept Excel were unreasonable in pursuing the claim. Mr Bush asked for a day's lost wages as he had to take a holiday. DJ Dodd replied that if he took a holiday there were no lost wages, that he had not brought along any proof of what he earned and in any case only needed a half day off. Lost wages therefore were refused. Mr Bush's travel and parking costs of £5.25 were allowed, to be paid by 30th November. After the hearing DJ Dodd commended Mr Bush on the quality of his evidence, stating that that was the only case she had seen today where the defendant even bothered with a witness statement. She also mentioned she had found for the defendant in a similar claim the previous week where Excel had claimed the defendant has parked while they were actually in a restaurant several miles away - the car park has two exits and is used as a rat-rn to cut off a corner. Mr Bush stated he would now never use Excel's car park and would always use Trinity Walk, which was cheaper, safer, well-lit and more reliable. Mr Pickup from Elms Legal was back in action today at Skipton Court. This was another hospital pass of a case from BW Legal. The defendant was not the driver, and as the notice to keeper was not compliant with the Protection of Freedoms Act 2012 sch 4 (POFA) conditions, there was no keeper liability. Mr Pickup therefore had no realistic chance of winning. In court it quickly transpired that although Mr Pickup regularly handles parking cases, he had no real grasp of the law surrounding POFA, so he asked the judge if he could bail out and confer with a more knowledgeable colleague outside. The judge allowed this. He returned with a list of comments which he alleged were from an online forum. He asked the judge if he could cross examine the defendant under oath and use the forum evidence. She refused the use of the evidence, but did allow a cross examination. His cross examination went badly wrong and ended working in the defendant's favour as everything was brought back to PoFA. Mr Pickup was clearly embarrassed and quickly gave it up as a bad job. The judge dismissed the claim, summing it up as follows, saying it boiled down to two things. 1. Either the claimant could PROVE the defendant was the driver... which they obviously couldn't. 2. They could comply with PoFA to pursue the defendant as the keeper... which it was proved they did not. The defendant was refused costs. Mr Pickup is now notching up an impressive record of losses against unrepresented litigants in person. It is not recorded whether his trademark signature of storming out of the courtroom on losing was put to good effect today. The defendant was straight back in court as Excel had filed multiple claims against him, all for the same car park. This second claim was brought by Excel directly. No doubt wisely deciding not to trust Mr Pickup with both claims, had hired a second representative. This hearing was adjourned as the court ran out of time. The claimant was given permission to submit new evidence including print outs from online forms and are also allowed to amend their witness statement. A key influence to the judge was Henry Greenslade's comment about no reasonable presumption, which she mentioned several times. Henry Greenslade is a barrister highly experienced in both private and public parking charges and is a former Lead Adjudicator at POPLA. Mr Greenslade had this and more to say on the subject of keeper liability in the 2015 POPLA Annual Report. This is available on the POPLA website at this link, pages 12-13. It is therefore well worth including this in any evidence. Here are the details from the impact assessment the Government conducted before enacting the regulations, available at this link. (1) Keeper Liability for parking charges incurred regardless of whether s/he was the driver at the material time as long the keeper has the option to name the driver in charge of the vehicle at the relevant time. (2) Make it a criminal offence for the keeper to refuse to name the driver in charge of the vehicle. It is the Department's view that option (1) is the most appropriate option to achieve the stated aims and objectives. Option 2 was discarded because criminal sanctions were deemed to be a disproportionate sanction to a parking charge on private property, which is essentially a civil dispute between two private parties. Therefore, no summary and analysis page has been produced. Todays Match of the Day Kicked off at Bradford County Court. Mr TS was representing himself. BW Legal were playing a late substitute, Ms Kauser. DDJ Philpson was refereeing. Mr TS received a PCN for Cavendish Retail Park and, after the usual letters from BW Legal, headed for Bradford County Court. Mr TS was not the driver. Mr TS had prepared his defence himself and was well prepared for the Elliott v Loake shenanigans BW Legal would try. The game kicked off and, from the start, the solicitor appointed for BW Legal appeared to be struggling for fitness and was possibly a late substitute as she appeared to be unfamiliar with the case notes, but she gamely played on. Next up was Elliott v Loake. The claimant’s solicitor took a swipe at “reasonable assumption” stating Elliott v Loake established this principal, but Mr TS stole the ball and headed for goal, pointing out it was completely irrelevant as it was a criminal case that had nothing to do with parking and that the verdict had turned on what Griffith LJ said was “ample evidence”. The Claimant had provided no evidence at all to establish the keeper was the driver. The ref agreed and awarded a goal, informing Mr TS that EvL had been distinguished from the current case. Motorist 2 – Elliott v Loake 0. On the restart, the claimant’s solicitor complained that the defendant knew who the driver was but refused to reveal who it was to them. But, by now, Mr TS was playing a blinder. He robbed her near the halfway line, pointing out there was no legal obligation to name the driver and, even if he did know who the driver was, why would he hand over their personal details to be harassed in the manner he had to a private company? The ref agreed and awarded another goal. Motorist 3 – Elliott v Loake 0. Deep into injury time, the ref then looked at the Claimant’s solicitor and asked “Anything else?” By now the situation was dire for the Claimant and, in a last throw of the dice claimed a pitch invasion had occurred and asked the ref for an adjournment. But he was having none of it, telling the solicitor that they had plenty time to prepare their case, they were not changing their witness statement now, and awarded the game to MrTS with costs of £110. BWLegal were as sick as a parrot. G24 Ltd have asked Gladstones Solicitors to enforce a parking charge of £15092015. Perhaps someone should teach G24 the different between money and dates. 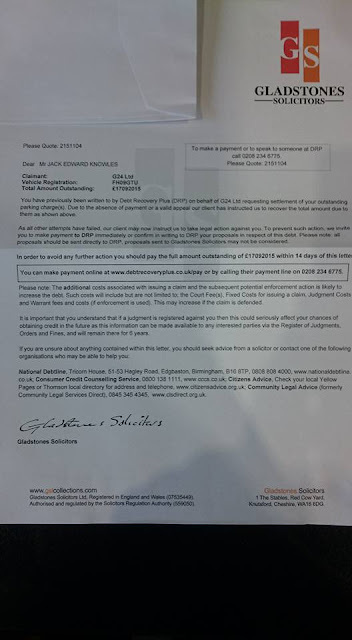 The letter does not give any way to contact either Debt recovery Plus or Gladstones, so the Prankster suggests that the email addresses of info@drpl.co.uk and enquiries@gladstonessolicitors.co.uk are used. Mr M was in and out of court in minutes. The judge dismissed the claim on the basis that the claim stated the vehicle was parked in Windermere road. However, it was actually parked in a different road - Stanier Close. UKPC's solicitor tried to argue this did not matter as he knew the car was in Stanier Close; however she put him right by informing him that the particulars of claim need to be correct. As the hearing was over so quickly, Mr M did not have time to bring to the attention of the judge that the notice to driver and notice to keeper were incorrect; and the so-called parking contract was with a company who did not appear to have the right to form a contract, as they were not the land owner or managing agent of the residence. He was also unable to bring to the attention of the judge that the evidence submitted by UKPC appeared to have been photoshopped as the notice to driver had the road name changed and was therefore different to the actual notice to driver. 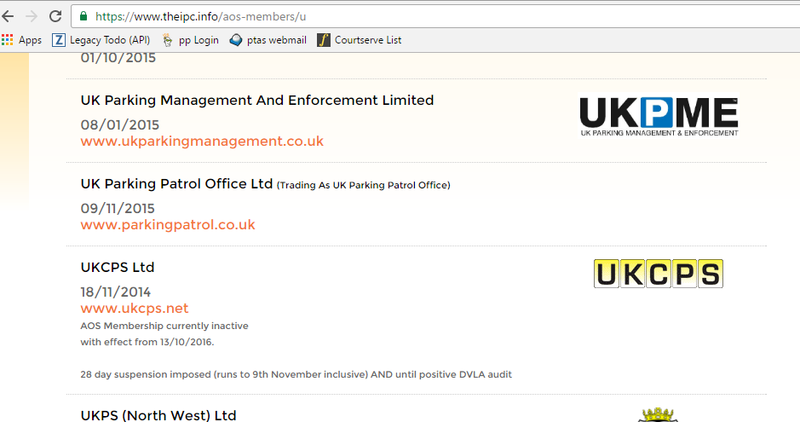 Additionally UKPC had the contract boundary map wrong, including areas which are controlled by another parking company. Lastly, even had UKPC got their documents correct, there was no liability. Mr M is a tenant and his tenancy agreement does not require him to show a permit to park. UKPC cannot therefore unilaterally override this tenancy agreement, as shown by several recent cases. Mr H parked and purchased a valid ticket which he displayed on the dashboard. When he returned to his car he found a parking charge because at some time the ticket had turned upside down. This was the second hearing. The first was adjourned. The judge dismissed the claim. He ruled that it was the responsibility of the parking company to provide sticky backed tickets and that he had already thrown out 6-10 of these type of cases which Link Parking had brought. With so many of these cases going to court it is obvious that Link Parking are not providing responsible parking management, but are out to rip off the consumer by trying to engineer as many charges as possible. This is a prime example of a predatory operation which is banned by the IPC Code of Practice. There are many practical solutions to this problem, ranging from the simple - providing sticky tickets or printing information on both sides - to the complicated - pay on exit ANPR. In this case Link Parking will have paid for their greediness by having to fork out twice for a solicitor to turn up and represent them, as well as Gladstone's other charges. The worry is how many innocent motorists will have been trapped into paying charges because of Link Parkings predatory practices. I have received a Claim Form from the count court. I was therefore wondering what to do?? Given the number of these that BW Legal must send out monthly, how can they possibly pursue all of them - the courts must be totally overloaded with them!? I am happy to go to court and argue the case, mainly because I trust that a judge will uphold the law and apply some common sense to the matter. However, I am simply trying to ascertain the likelihood of that actually happening, and whether I am wise to continue to ignore their letters on these grounds, or whether I should formally acknowledge their contact and refuse to pay? Sadly this is typical of many such emails. Many people also say they do not believe the claim form is valid because the paper quality is poor, or that it has not been affixed with a proper seal from the courts. Parking companies love people like that. The sad truth of the matter is that if you ignore the claim form, the parking company will apply for and get a default judgment. This is then enforceable and if you do not pay, fees rack up and you have a CCJ against your name for 6 years. You should therefore either pay up, or defend the claim. Typically costs only go up by £25 hearing fee if you defend, so if you believe you have a case defending is often the sensible way forward, and you are not risking much. Even though you are up against legal 'professionals', parking companies use firms such as Gladstones Solicitors and BW Legal who have been proven to be incompetent, slapdash, and to have a poor understanding of the law. The more disreputable parking companies and solicitors will also pad the claim with amounts they know will not be allowed in court. This is because if they a default judgment, the motorist will have to pay these. This means that if say, one of the more disreputable firms like Gladstones Solicitors file a claim for a charge of £150, if it goes to a hearing and the motorist lose most judges will only allow £100. Thus, it is financially better to defend the claim rather than pay up as although you will have incurred a £25 hearing fee, you will get £50 knocked off the amount. Alternatively, if you believe the £100 parking charge is valid, you can admit that part of the claim, but dispute the artificial charge which Gladstones add. In that case any hearing would be only about the validity of the extra charge. Lastly it is worth pointing out that you cannot add defence points later. Your initial defence should therefore raise all points of dispute. You can expand on these at a later time, but not add new points. For instance, if you claim the signage is poor and therefore no contract was in place, you can at a later time add evidence such as maps, videos and photographs to back this up, plus references to codes of practice and signage requirements, and also transcripts of court cases relating to signage forming a contract. Hapless solicitors Gladstones Solicitors have told Mr Knowles he owes G24 Ltd £17,092,015. The Prankster understands Mr Knowles will contest the claim. Confirming the suspicion that the IPC will stoop as low as is needed to get new members, they have now accepted The Car Park Enforcement Company Limited. CPEC(a) is owned and run by Ghulam Abbas and Shazad Murtaza and appears to be an obvious phoenix of The Car Parking Enforcement Company Limited. CPEC(b) was owned and run by Ghulam Abbas and Shazad Murtaza. 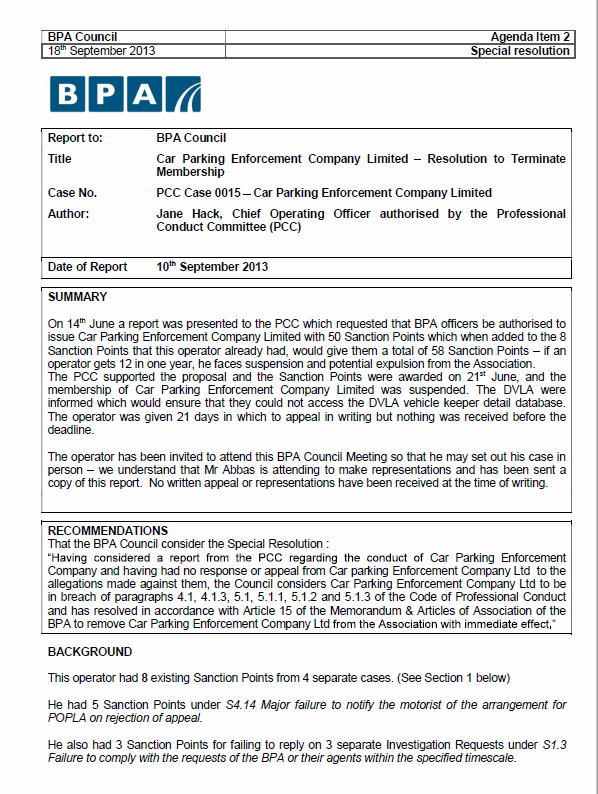 The Car Parking Enforcement Company Limited were chucked out of the BPA for incurring a record 58 sanction points in one year, including enforcement action on sites with no signage, significant signage/notice contravention, failing to inform motorists they could appeal to POPLA, failure to respond to BPA investigations and operating where no landowner authorisation was in place. If a person with the worst ever record of running a parking company can gain DVLA access just by creating a new company, this is of extreme concern. The DVLA need to ensure there is some standard of competence in the organisations they award ATA status to, otherwise crafty operators like Ghulam and Shazad will make a mockery of the system. UKCPS 28 day suspension from the IAS is now over. However, they still need a positive audit from the DVLA. So far there is still no information on what they did to get banned. Mr C represented himself. Georgina Philpot, a PCMUK employee, represented PCMUK. Mr C binned everything PCMUK had sent up to the claim form, as he mistakenly believed it was to do with another matter. The PCMUK evidence pack included some kind of notice of keeper liability sent a long while after the incident. Georgina Philpot tried to squeeze a copy of the supposed original NTK into the hearing but the judge was not even remotely impressed and dismissed the claim as there was not so much as a shred of evidence to show that they had even sent it within 14 days (there was no window ticket). The judge gave Georgina Philpot a pretty good talking to about it, which was amusing for those not the subject of the tongue lashing. PCMUK's preparation was distinctly half-baked and before the hearing even got going Georgina Philpot had to ask the judge to replace one of the pictures of a sign from the judges evidence pack with one from the defendant. Sadly from the defendant's point of the view the case never got as far as the 'no contract' argument he wanted to raise regarding their absurd signage, but as the defendant said, "A win's a win". Georgina Philpot runs this side of the PCMUK operation, and is their Legal & Debt Recovery Manager. So, while she may have had a nice day out in London, she will have to carry the can for the brunt of the incompetence. Nevertheless, as the claim was filed by Gladstones (who appear to have done no due diligence whatsoever), PCMUK, you've been Gladstoned! The Prankster would like to remind reader's of PCMUK's attitude to the evidence and the truth, as revealed in a BBC Watchdog undercover operation. This picture shows how some types of ANPR errors occur. This occurred at the CitiPark Gade car park in Watford. The second letter 'L' has been misinterpreted as an 'E', possibly because of the faint smear of dirt on the plate. 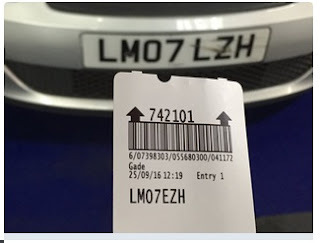 This is a barrier controlled car park, so this could cause a minor problem on exit if the misread does not happen a second time, and different lighting conditions cause the ANPR software to correctly recognise the 'L'. In an ANPR only car ark where there are no barriers, this could cause the software to record a car which entered but never exited. Normally this would be to the benefit of the motorist, as if they overstayed the ANPR would not know, and no ticket would be issued. Problems occur if the motorist visits twice, and only the first entrance and second exit are detect. In that case the keeper would be issued a ticket for an overstay, when actually they only made two hort visit. Although car park operators like to give out the aura that ANPR is infallible, it does actually have a high percentage of errors. This article from Parking Trend International reveals that although manufacturers claim 98% reliability, operators find they only get 90%-94% accuracy in real conditions, so as many as 1 in 10 plates are misread. In non-ideal conditions accuracy can fall as low as 60%. Mr R parked outside of a marked bay and on a yellow hatched area by about 8 inches as a courtesy to the car next him, as otherwise the driver wouldn't have been able to get in his car. The Judge questioned Gladstones competece; "Do they even know what they're doing.....?" and dismissed the claim, agreeing that Mr R had acted reasonably and courteously. An observer reported that Kevin McManus was spitting feathers! Kevin McManus left the BPA to join the IPC. It is one thing to use the so called "Independent" Appeals Service to push through bogus parking charges. However Parking Companies are then encouraged by Gladstones, with their pitiful grasp of legal issues regarding parking, to file a claim. At that point they realise that Gladstones legal expertise is so much hot air. Kevin McManus, you've been Gladstoned! "Do they even know what they're doing?" Apparently not. It is therefore incomprehensible that the government allows the two charlatans Will Hurley and John Davis to run a parking ATA without properly supervising them and making sure that someone who does understand the law regarding parking runs the "Independent" Appeals Service. In this case Ms S drive through a car park on her way to an MOT, in order to avoid a blocked junction, then drove back again afterwards. Excel's ANPR being flawed, she was issued a parking charge for one long stay. This was disputed, but Excel refused to see sense and dismissed the appeal, then eventually filed a claim through BW Legal. In the red corner, Mr Pickup of LPC Law; in the Blue corner, Mr Wilkie of PPA. Pay and Display terms, all of which were fully conceded by the defendant. There was no issue over who was driving, no denial that the car entered at the time stated, or left at the time stated. The only problem is, the car park, which has two entrances and exits was being "cut through" to avoid a blocked junction, and the driver was taking her car to a garage for an MOT. Despite this, Excel's ANPR didn't detect her first exit and second entrance, and so an NTK was raised for the full 351 minutes. The Defendant appealed, supplying a copy of the MOT, proving the car could not have been there at the time. This was, as is par for the course, rejected, and the Defendant elected not to ask Skippy the Bush Kangaroo and his joke "Independent" Appeals Service to give an opinion. BW Legal sued on behalf of Excel. The Defence was the same as the appeal, and again supplied a copy of the MOT. In fact, the Defence and the MOT were the only documents supplied. It was suggested by Mr Pickup that maybe the car was parked in the car park while it was being MOT'd half a mile away. The judge discounted this, stating that there was no evidence to rebut the timing on the certificate as being a time the car was present at the test centre. The judge, in summing up, made the point that the Defendant's defence has been consistent throughout, and,given the status of an MOT certificate, this is compelling evidence that the Defendant's car was not present for the entire time. Additionally, since the evidence of this had been provided long before proceedings were commenced, this meant the claim had no reasonable prospect of success. The judge therefore found that the claimant had acted unreasonably, and so made an award of punitive costs against the claimant in the sum of £160.95 using CPR 27.14(2)g.
Parking Companies have a duty to properly consider appeals. ParkingEye, a BPA member, claim that they allow about 60% of appeals, and have a further 45% cancelled at POPLA. Excel are IPC members, and as such do not have a fair and open appeals process. Simon Renshaw-Smith, Excel's main shareholder, stated that the main reason he moved to the IPC was so that he would not lose so many appeals. It is clear this decision has come to bite him in the foot. There is really no justification for a parking company or an Associated Trade Association to run a sham appeals service. Mr Pickup was reported to have stormed out following the hearing. The Prankster can sympathise as he had just lost 2 cases on consecutive days; however, he was handed hospital passes by both clients. Mr Pickup can take heart by remembering that his duty as an advocate is to help the courts reach the correct decision, which is not the same as ensuring his clients win. As the correct decision was reached both times, Mr Pickup can sleep soundly in his bed tonight.